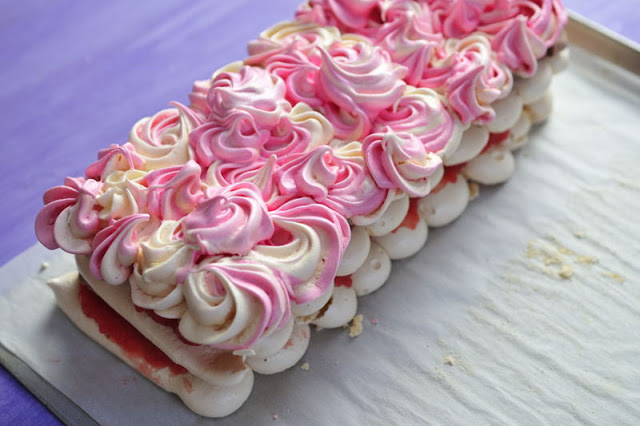 There are so many delicious desserts you can make from egg whites, from souffles, fruit mousses, buttercream, meringue cookies, French macarons, fruit sorbets to decadent meringue layered cakes. Just like the one I made recently, Vanilla Meringue Cake filled with Strawberry Chocolate Cream. 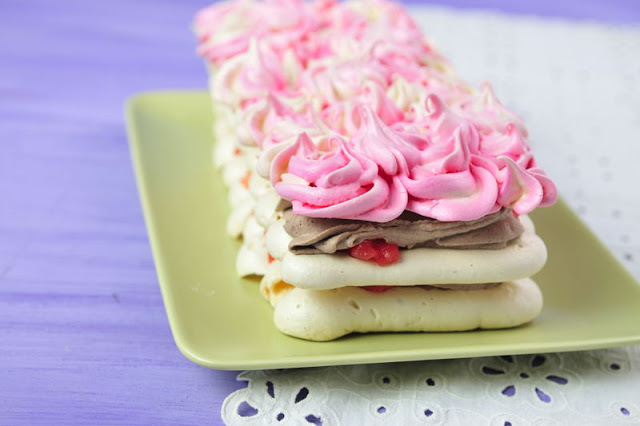 Now, if title is not enough to seduce you, then imagine sweet strawberry with creamy chocolate, wrapped in a crunchy vanilla cookie, all singing in a perfect delicious harmony. Really, I mean it, it was fantastic. Onto the parchment paper, trace the template(10×4) 3 times. I used a large cookies sheet so I fit all 3 layer on one sheet. Make sure the bowl of your mixer is grease free. Wipe it dry with white distilled vinegar if needed. Beat in cornstarch and vanilla extract. 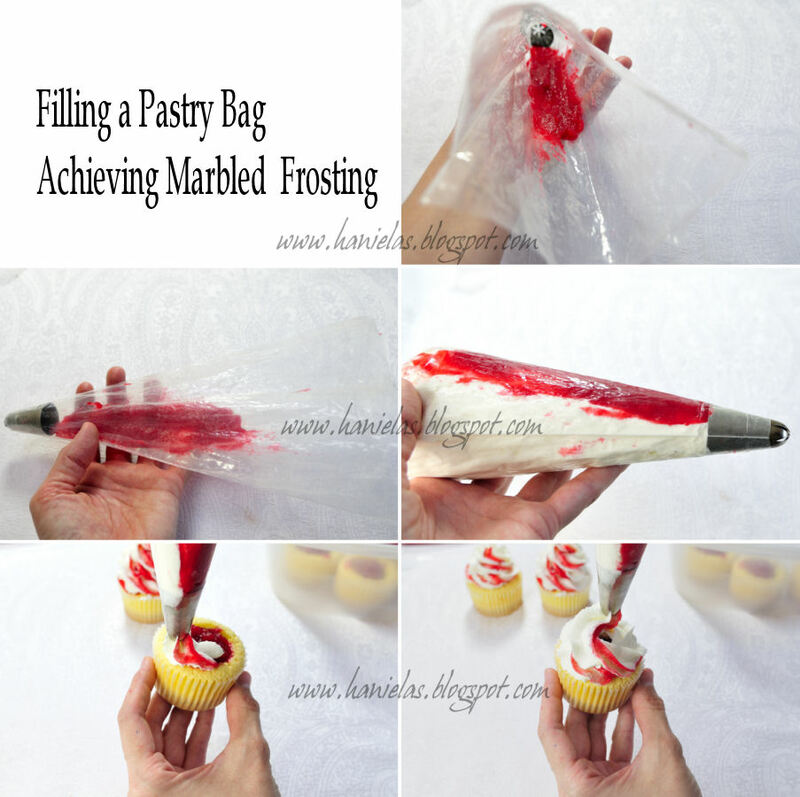 Fit the pastry bag with large round pastry tip, fill the bag with meringue. Pipe the meringue onto the prepared parchment paper, following the rectangular patterns you prepared before. 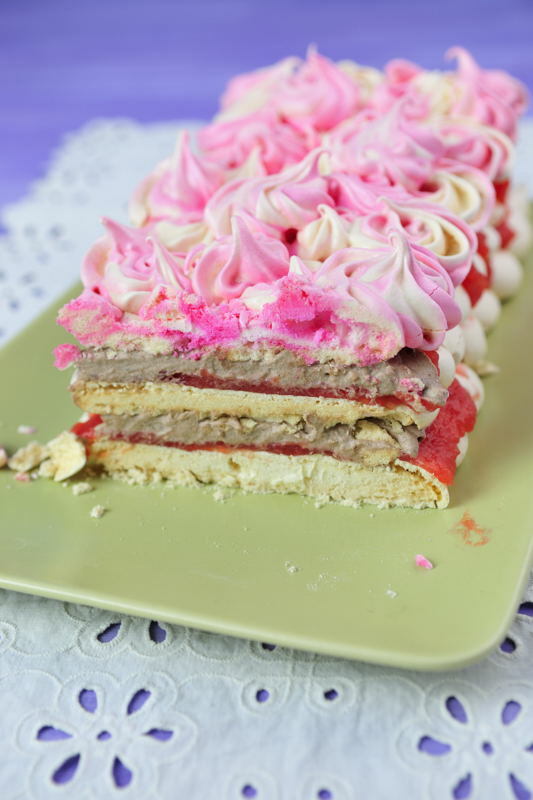 Make 2 layers. 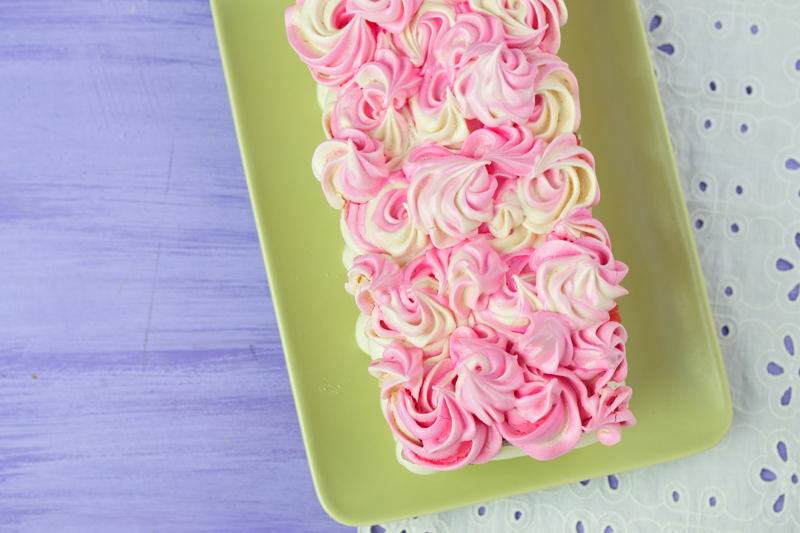 To make the top layer : color about 1cup of remaining meringue with pink. 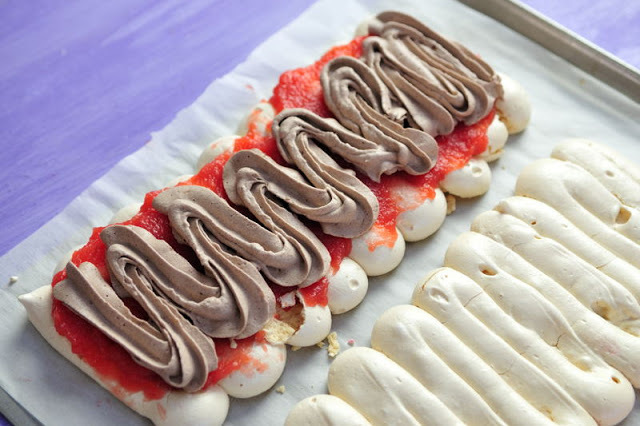 Take the piping bag and pipe little and large rose/flower shapes onto the last 3rd template onto the parchment paper. Bake at 275F for 45 minutes. 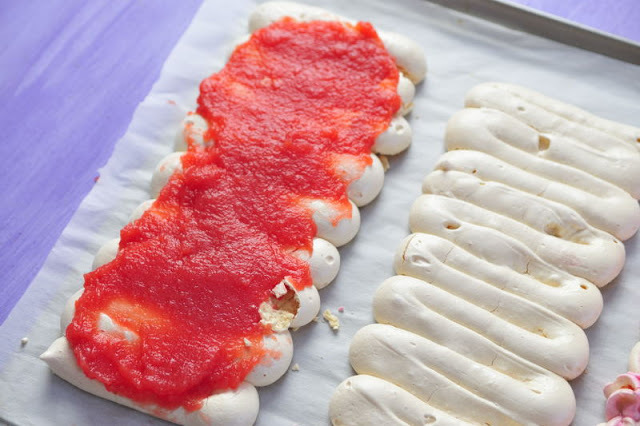 Turn off the oven and let the meringue layers in the oven until it cools down completely. If not using the same day, store meringue layers between layers of wax paper, in a large airtight container. 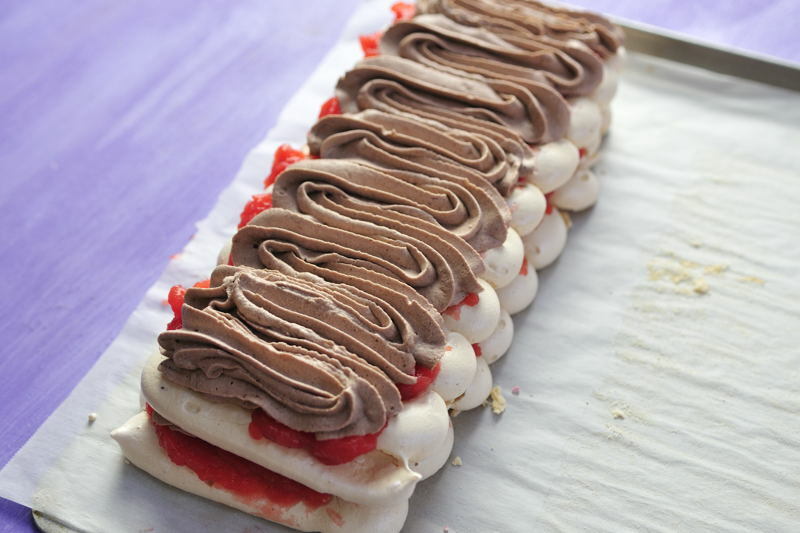 Fill the layers with strawberry and chocolate filling, alternating with meringue layers. 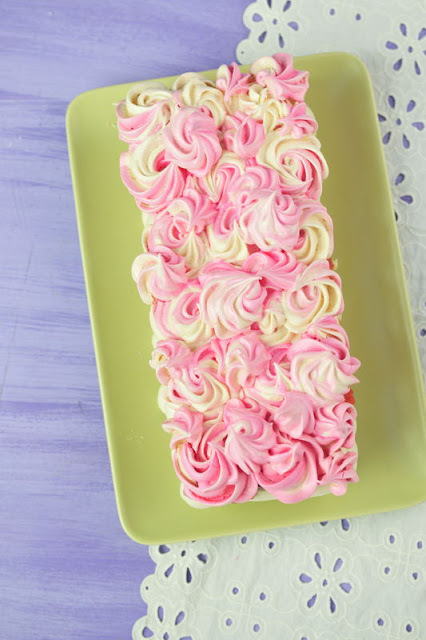 Serve the same day cake is filled. seeds.You should have about 1cup (or little over 1 cup) strawberry liquid. dissolved gelatin cool to lukewarm. 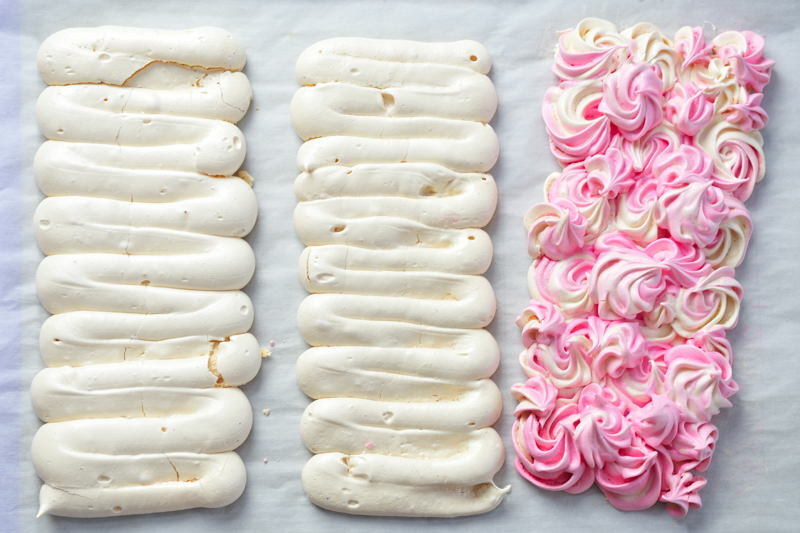 don’t over beat.Use as frosting on meringues cake, cupcakes and cakes.